Creobroter are middle-sized, beautiful mantids. 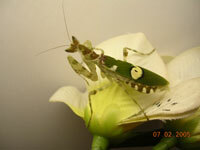 They are also called "flower-mantis". This mantids are spread in Asia. Both genders have long wings and are able to fly. Their eyes will change the color into brown to violet at night. At present, at least 21 species are described, e.g. Creobroter elongata (BEIER, 1929), C. fasciatus (WERNER, 1927), C. medanus (GIGLIO-TOS, 1915), C. nebulosa (ZHENG, 1988) and C. urbanus (FABRICIUS, 1775). Creobroter are very beautiful mantids. They are recommendable for beginners because they are easy to keep and breed.